This is the first page of the prologue. 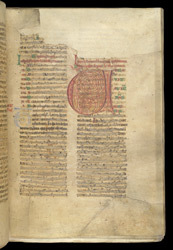 The whole page is somewhat worn, and much of the writing has flaked away, but the large foliate initial 'C' remains fine. In the top right corner of the page, to the left of the numbers and letters, is the late-medieval place-name 'Kyrkestede', and on the final flyleaf is a 12th-century inscription, 'Liber monachorum sancte Marie de Kyrkestede', indicating that the manuscript belonged to the monks of the Cistercian abbey of Kirkstead, Lincolnshire (see also Royal MS. 7 F.v).